The understated distinction of this room is evident upon first entering. Three large windows provide a bright, inviting environment. 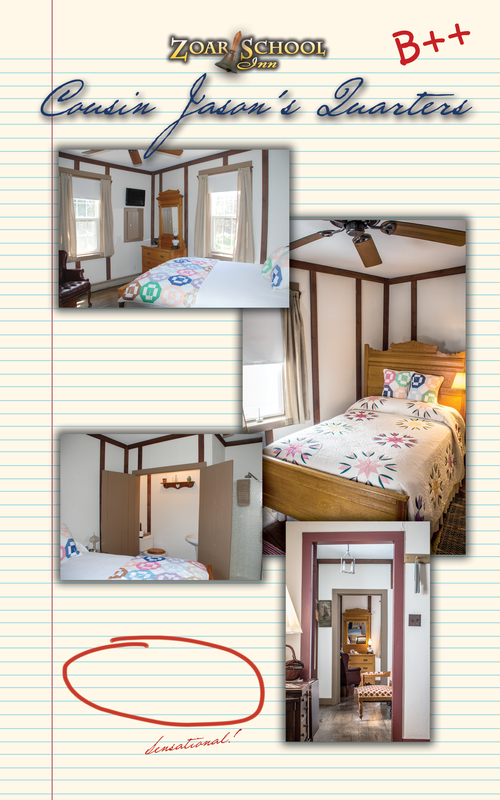 Features a full size Original Zoar Bedroom set from the Zoar Hotel. Flat screen TV with DVD. Private ensuite half bath with Shower. Warm Wood beams create a soothing atmosphere. Its pleasant sitting area overlooking the yard creates a serene background for relaxing. The corner television, DVD player, Cable TV, and refrigerator complete its amenities. Cousin Jason's Quarters invites you to relax. Based on 2 person occupancy per night.